The purpose of the first visit is to build a trusting relationship with your child while laying the groundwork for a lifetime of healthy gums and teeth. Along with the American Academy of Pediatric Dentistry, we recommend that the first visit takes place by the child’s 1st birthday. At this appointment, the dentist and staff will focus on getting to know your child. After gathering a detailed medical history, we will perform a complete oral exam and age-appropriate dental cleaning. Any findings will be discussed and recommended procedures will be thoroughly explained. At this point, we will answer any questions you may have. 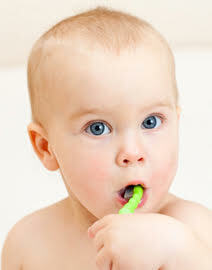 Along with a general examination and cleaning, we will discuss brushing techniques, flossing, fluoride recommendations, and healthy eating habits, tailored to your child’s specific needs. As a parent, you can help make your child’s first visit to the dentist positive and enjoyable. Be sure to inform your child of the visit and its purpose, but take care in how you present it. You may want to show your child photos of the dentist and other happy children on our website. Please avoid using words that cause fear such as “needle”, “shot”, “pinch”, or “drill”, as they suggest an unpleasant experience. Most importantly, please do not tell your child that the dentist will not “hurt”. Since children are extremely intuitive creatures, it may never have even occurred to them, but simply hearing the word could develop a new fear that didn’t initially exist. You may want to consider picking up one of the many wonderful children’s books dedicated to the topic of teeth and dentists. We are happy to offer suggestions. Keep in mind that pediatric dentists are specially trained to handle fears and anxiety, conveying the information in a non-threatening way, while our entire staff is experienced at putting children at ease and will to keep your child calm and comfortable. Parents are welcome and encouraged to accompany their child during the initial exam. This gives us the opportunity to communicate directly with you about your child’s dental health. If subsequent visits are necessary, we will always welcome one parent back in the room during treatment, however, we kindly ask that you assume the role of a silent observer. This allows us to focus 100% of our attention on your child and vice versa, creating the ideal environment for us to begin building a secure and comfortable relationship. Keep in mind that studies have shown children 3 years of age and older tend to do better when they are left to experience their visit independently and in the care of a specialized pediatric dental staff.